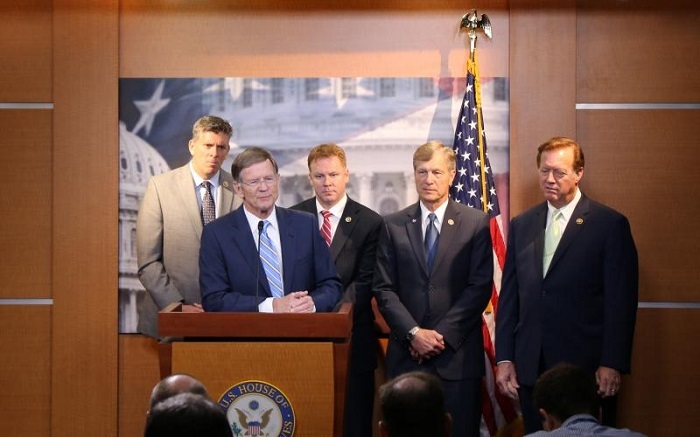 Lamar Smith at a press conference in summer 2016, accompanied by four other members of the House Science Committee. Smith is beginning his third consecutive congressional term as committee chairman. The Science Committee plans to create transparent environmental policies based on sound science and focused on innovation rather than regulation. The committee will work to make sure every agency research dollar spent works for the taxpayers who fund them. We’ll work to re-stake America’s leadership in STEM concentrations by crafting critical science education initiatives, and we will conduct rigorous oversight of cybersecurity standards and breaches at federal agencies to ensure all Americans’ private information is secure. Rebalancing NASA’s portfolio and setting course for its future successes will also be a key priority this Congress. In addition to these items, promoting basic energy research is listed as a committee priority. The House has in fact already begun legislating in this area. The full House last week passed the bipartisan “DOE Research and Innovation Act,” which incorporates seven House-passed committee bills from last Congress. Among its numerous provisions, the bill would provide the first-ever comprehensive policy guidance to the DOE’s Office of Science and its national labs. The committee will continue to prioritize basic research at the Department of Energy, and will work to limit spending on late-stage commercialization programs that distort the energy market. Critical reforms are needed to ensure the Department of Energy spends limited federal research dollars on discovery science that the private sector cannot conduct, not loan guarantees and subsidies. Smith also specifically highlighted the importance of U.S. leadership in space science alongside human space exploration. As in the past, Smith is calling for a “rebalancing” of NASA’s portfolio. With a Trump adviser having suggested that NASA earth science may be better suited for another agency, the balance between earth science and space science at the agency is likely to emerge as a point of contention over the next few years. Many of Smith’s goals and priorities build on legislative and oversight efforts that began last Congress, when the full House passed a number of the Science Committee’s bills. For example, the committee intends to address “major facilities reforms…under the paradigm of the National Science Foundation,” an issue the committee focused on last Congress. The House passed Smith’s “NSF Major Research Facility Reform Act” last June in a nearly unanimous vote, and some of the less stringent provisions in the bill were incorporated into the American Innovation and Competitiveness Act that President Obama signed into law earlier this year. In order to build a broad consensus in Congress and with the White House, however, Smith and his colleagues sometimes softened bills before they came to the House floor. Now that Republicans control Congress and the White House, Smith may revisit some of the more contentious provisions of his committee’s legislation from last Congress. However, Smith provides no indication as to whether he will continue investigations into scientific studies and findings released by the science agencies. Starting in 2015, Smith made requests and issued subpoenas in order to access National Oceanic and Atmospheric Administration correspondence and other documents connected to a scientific study related to the global temperature record that the agency had led. Smith is also promising that the committee will examine cybersecurity standards, which the National Institute of Standards and Technology plays a leading role in developing and validating. Smith has cited concerns about China’s recent successes in hacking into federal systems, including NOAA’s weather satellites. I’m disappointed, but not surprised that the Chairman’s agenda for this Congress includes pushing anti-science bills designed to interfere with EPA’s mission to protect public health and the environment and cutting investments in clean energy at DOE. That said, I stand ready to work with him and want to seek good bipartisan policy agreements in areas across our jurisdiction.